In the past several weeks I've tried some new products ranging from BB creams to leave-in conditioners - and I'm here to tell you about it all. In the last year my scalp started itching, it was annoying and disgusting. It may have been due to pregnancy hormones or continually using cheap shampoo, but either way it was uncomfortable. 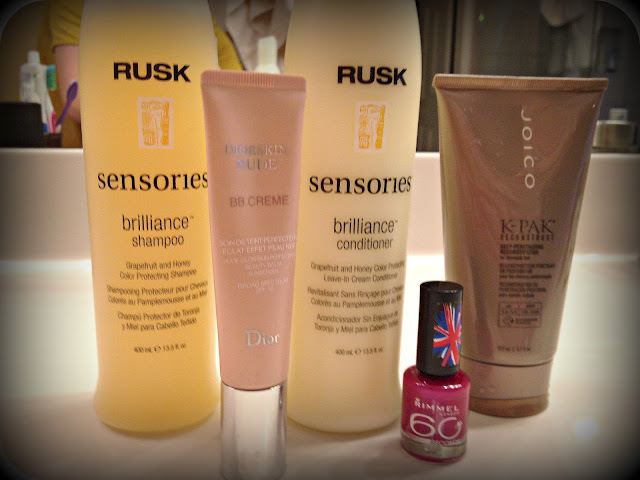 I needed to make a switch so I decided to try Rusk Sensories Brilliance Shampoo. I color my hair so I wanted something that would maintain my do but would also help revitalize my scalp - this is the product. I've been so happy with the results. My scalp honestly hasn't bothered me since I started using this and my color looks just as good as it did the day I left the salon. After my last trip to the salon my hairdresser recommended investing in a good new conditioner. Again, hormones have changed the texture of my hair and all of the sudden I'm dealing with dried and split ends. I thought buying the shampoo and conditioner pair would yield the best results. For me that wasn't the case. This is a leave-in conditioner and even when I only used a small amount, it leaves my hair feeling greasy. My hair lost its bounce and shine and it looked dirty. I stopped using this after only 2 weeks because I was so disappointed in the results. If you follow me on Instagram then you're already aware that I've been using this product. In fact, I've been using BB Creams for about a year now. I've tried several different varieties, but most of them hail from the grocery store. I finally decided to take a leap and invest in a good BB Cream and I'm so glad I did. If you're new to BB Creams think - tinted moisturizer with extra benefits. BB Creams are supposed to help reduce redness and even skin tone and this does everything it promises. I wear very little makeup to work but I choose to wear this everyday. It lasts throughout the day and it feels so light and airy on my skin. I don't feel like I've caked on tons of makeup but I still look like I've made an effort to put myself together each morning. I like having my nails done by a professional but since I'm capable of painting my nails myself I do them at home instead of getting manicures. I save an extra $15-$20 a week and I'm starting to grow a pretty stellar polish collection. While shopping for my Cara Box partner I stumbled across a nail polish that promised to dry in :60. Since I have a little one and time is of the essence, I thought I should give this a try. Honestly, I thought it would leave my nails with that weathered, almost chalky feel once it dried but I was surprised by how smooth it felt. It didn't dry in 60 seconds, more like 3-5 minutes, but it was quicker than my Butter, Essie, and OPI polishes. In addition to the Rusk Sensories Brilliance Conditioner I also wanted to try the Joico Deep Penetrating Reconstruction for a deeper conditioning treatment. I've used this conditioner once a week and so far the results have been favorable. My hair feels less brittle and it does exactly what I expected it to do it terms of treating my hair. Overall I'm happy with it but I likely won't purchase the product again. If you're interested having a product reviewed please let me know about it here. Thanks for stopping by Sarah! I haven't tried Hope in a Jar yet but I've heard amazing things about it. I'll put it on the "Must Try" list.